The 100-hour Ultrasonic Warm and Cool Mist Humidifier guards against problems caused by dry air in the home. It features an easy to fill large 2 gallon tank, ideal for use in medium to large rooms. A UV-C Light reduces germs to emit a cleaner mist while Silver Clean Protection is embedded in the tank to fight the growth of mold and mildew on the surface of the water tank. Thanks to ultrasonic technology, it disperses a fine mist into the air, and is ultra-quiet making it ideal to have on while you sleep. 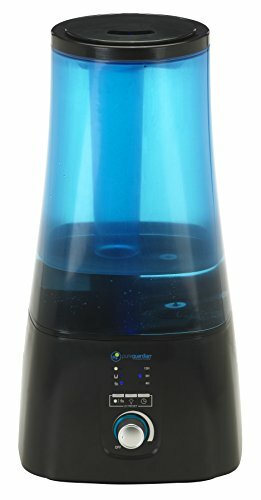 This humidifier has an optional aromatherapy tray so a few drops of essential oil can be added to create a relaxing atmosphere. It is equipped with the option for warm or cool mist and 3 speed settings. A low water indicator light lets you know when it's time to refill the water tank. It also features a soft glow night light, and a timer. PureGuardian humidifiers create a better home environment for those suffering from colds, allergies and dry skin. Note: Run time is based off of running the unit on low setting and cool mist, also depends on atmospheric conditions. PureGuardian aromatherapy oils are not included and must be purchased separately. 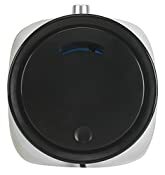 Do not add oils to the humidifier tank as they can damage the humidifier and void the warranty. Only add essential oils to the pad that is included with the unit. 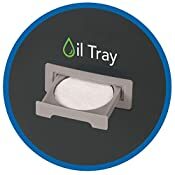 Additional essential oil pads are available separately. Aromatherapy Tray option helps create a relaxing environment with your favorite essential oil. Oils not included.